It’s a rather strange and ferocious-looking creature, is it not? Somewhat like a bear or an ape, walking erect with claws extended, it is clearly revered by the people who have come to lay down treasures before this statue of it. Since that is “Everest” in the distance, we can be sure that we are approaching the Himalayas, and that can only mean that this feared-revered creature is none other than the fabled Abominable Snowman, a.k.a., the Yeti. This creature has been the subject of countless expeditions and studies by scientists, writers and adventurers for several centuries. 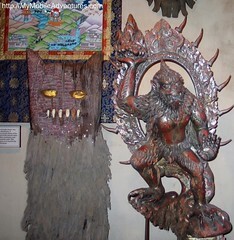 The people of the Himalayas have made the Yeti the subject of much of their local art and folk lore. 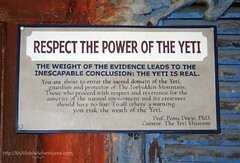 The Yeti is the stuff of legend, much like “Big Foot” a.k.a. Sasquatch in North America. Primatologists, anthropologists and many other types of -ologists, I’m sure, have studied such evidence as footprints and hairs left behind by this creature, but no evidence has thus far been deemed conclusive insofar as proving the existence of the Yeti. The Yeti so captures the human imagination, there have been expeditions in search of one as recently as 2008, when a band of Japanese researchers went off adventuring into the Himalayas to see if they could find one. Scientists routinely test “evidence”, usually hairs that are claimed to have come from a yeti, but DNA results indicate that they are always some other type of animal, chiefly bears. That region of Tibet enjoys the presence of three different types of bears – blue, brown and red, and the word “yeti” seems to be derived from two Tibetan words, one for “bear” and the other for “rocky place”. Given the location, “rocky place” does make sense. One of the pet theories that has been floated now and then about both the Yeti and Big Foot is that somehow, the gigantopithecus giant ape from the Pleistocene era has survived and is alive and well and living in the Himalayas. It’s a nice theory, but most scientists agree that gigantopithecus was a quadruped, which would not explain why the Yeti is able to climb up Disney’s Expedition Everest attraction on two legs while ripping up the tracks with his hands! I guess those fans of the gigantopithecus theory have not been to Disney World recently. Previous PostFriday the 13th at Walt Disney WorldNext PostEPCOT at Walt Disney World – blue, yellow, CANDY! Hi, Tink. I particularly enjoyed this post because we just came home from Disney. 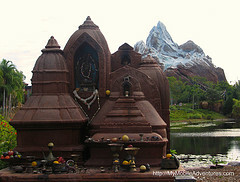 I wish I had known about the Yeti tearing up the tracks on the Expedition Everest ride. My 5-yr-old, who was so excited to be tall enough to ride, was not amused to say the least. 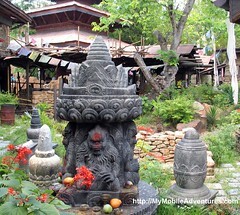 The displays inside the attraction are very interesting though, as is your post. Wow, you are just a fountain of information!!! I would dearly love to “do” Disney World with you. 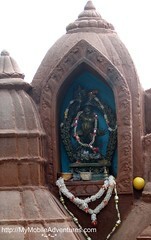 I saw that shrine but totally missed it’s significance. Great critter post and equally great photos. You wrote an interesting post. Cheers. Is it unofficial Disney day? Fun interesting post. I wondered as I read this, “If the Yeti were actually for real, wouldn’t they have figured out a way to chase the Chinese out of Tibet by now?” I mean let’s face it, who’d want to tangle with one of those?? Cool sequence here… that first shot almost looks like the whole building is made of chocolate… figured that was a Valentine connection until I started reading. Thanks for filling me in on the 15 minutes, I had no idea! I should probably check out Google Reader at some point, I’ve just never gotten around to it. I really enjoyed this! Very interesting. I want to get to Disney again one of these days. It has been so long. In answer to your question about Bango on my blog, I added some info and a link to the post. The significance will become clear I think, it could have been a lot worse for you (or better, depends what you think).